Bradford Werner - Guitar Lessons in Victoria, BC. Bradford Werner resides in Victoria, BC, Canada where he teaches classical guitar privately and at the Victoria Conservatory of Music. Bradford teaches a wide range of students from dedicated youth to hobbyists adults and post-secondary students. 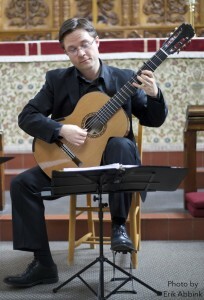 He regularly adjudicates festivals, and has given exams and masterclasses for a variety of organizations including The Alberta Provincial Festival, Mount Royal University Conservatory, Calgary Guitar Society, Camosun College, Medicine Hat Rotary Festival, The Northwest Music Festival, and many more. Bradford holds a diploma in music from Camosun College, an A.V.C.M. in music teaching and performance, and a BA in history from the University of Victoria. He is a member of the Quelus Guitar Duo, and the Victoria Guitar Trio with Michael Dias and Adrian Verdejo. The trio has commissioned numerous world premieres and, with the support of the Canada Council for the Arts, has recorded an album on RedShift Records showcasing contemporary Canadian composers. Bradford edits and owns the online publication This is Classical Guitar. With over a million visits a year and a newsletter with thousands of subscribers, the website has become an exciting digital publication and outlet for sharing and communicating with the guitar community. Also see his newly created sheet music company Werner Guitar Editions which provides sheet music paired with video performances and lessons.